A massive landslide at Freeport/Rio Tinto's huge Grasberg copper and gold mine in West Papua, which killed eight people and injured another five, has sparked angry protests. The fatal accident happened early on October 9th, when part of the southern wall of the vast open-pit mine collapsed, and 2.3 million tonnes of rock and mud crashed down, engulfing mineworkers and heavy machinery. 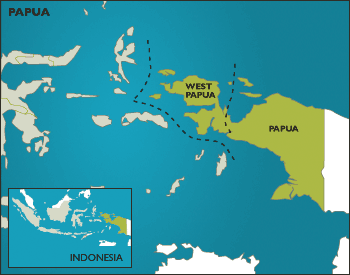 The famine in the central mountains of West Papua has claimed thousands of lives this year. Recent information from the area tells how the Indonesian military are making matters worse, while Jakarta ignores the tragedy. Villagers in the remote, rugged terrain of the central highlands of West Papua are continuing to starve.